PVM Dean Willie Reed with Dr. Jack Walther Leadership Award recipient Janet Roque-Torres at the Western Veterinary Conference. 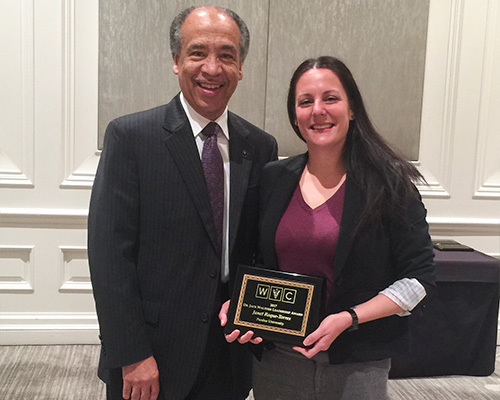 Congratulations to Janet Roque-Torres of the DVM Class of 2018, who received the Dr. Jack Walther Leadership Award this week at the Western Veterinary Conference (WVC) in Las Vegas, Nev. The award recognizes veterinary students who portray leadership and promote lifelong service to the veterinary medical profession. Janet is one of 33 DVM students, from universities across the country, selected to receive the honor. This prestigious award is granted to third-year veterinary students attending North American veterinary schools and colleges, who are actively involved in their education and demonstrate long-term leadership potential. The award is named in honor of Dr. Jack Walther, who has attended the annual WVC for 52 years, serving as a committee chairman, board member, and president. He also served as president of the American Veterinary Medical Association from 2003-2004. Dr. Walther's incredible dedication to veterinary medicine began in Reno, Nev., where he started a small animal practice in 1965. Each recipient of the award receives $1000, along with complimentary registration, airfare, and a daily stipend to attend the WVC, which was held March 5-9. The recipients also receive an additional complimentary registration to attend a future WVC Annual Conference. Funds totalling more than $1 million have been awarded to students from every accredited veterinary school in both the United States and Canada since the award's inception.